…golly gee, I think I might publish a book. While I’m at it, why don’t I start a new blog? The book is coming out with a wonderful small press, Seraph. When you publish with a small press you are accepting that there is little marketing budget and everything you can do to promote your own book is going to help a lot. Welcome to my self-promoting soap-box. Helen – The book’s looking good – looking forward to it. 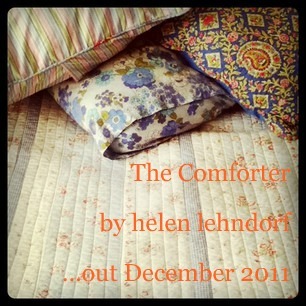 I like that it’s called The Comforter and you only see your husband at bedtime! Yuss, little presses are the best presses…..and there are always, always weeds, aren’t there? So so so so so so SO happy to find you blogging again! And what wonderful news to know a book is forthcoming! Sorry to hear about the overwhelming “To-do” list, and hope that you continue to do the things that make you feel good.